How do I start this review? The Muppets is a wonderful movie. There; that’s my start. Not only is it a wonderful movie, but it is an important movie. Pop Culture of late has reinforced the idea that the only comedy is cynical comedy. Many TV shows and movies fall in line with this, and in turn we as viewers follow suit. The Muppets acknowledges the change in the times, questioning its own relevance in a world where kids would rather watch a show called “Punch Teacher” (A fictional TV show in the movie that is exactly what it sounds like) than spend some earnest time with our family of felt friends. The film succeeds at doing what the franchise has always been good at: singing and joking its way to its audience’s heart. 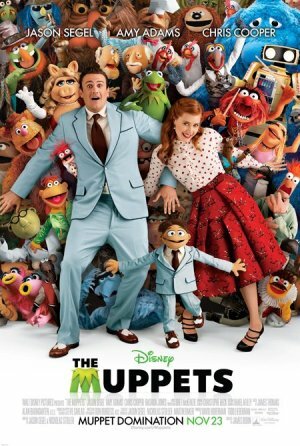 The opening number with newcomer Muppet Walter and Gary (played by Jason Segel) is as good as any Muppet musical score that has come before this point. It put a whimsical smile on my face in a way that I couldn’t recall since Amy Adams (also in The Muppets) did in Disney’s Enchanted back in 2007. The plot of the movie is fairly standard. Walter is somewhat of an outcast, a Muppet living in a human world. He is also the biggest fan of the Muppets, and jumps at the chance to travel to The Muppet Studios in California with brother Gary and his girlfriend Mary (Amy Adams.) Upon arriving however, we see that the studio and theater are run down and about to fall into the hands of Tex Richman (Chris Cooper), who much to Fox News’ dismay is an evil oil baron. What follows is the go-for-broke plan of getting the band back together to save the theater. This being of course because The Muppets have all gone their separate ways in the past decade or so; (In my opinion because they were all ashamed of 1999’s Muppets From Space, but I digress.) Throw in a few different set locations and classic Henson-esque meta-textual self-awareness, and you’ve got the latest great Muppet movie.